Multi-touch monitors are everywhere - increasingly so in business. However, fact remains that some people still prefer the old keyboard and mouse combo to avoid suffering a serious bout of arm ache. 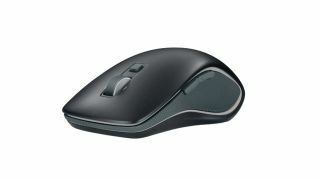 Recognising this, Logitech has unveiled the M560, a wireless mouse with a square button that lets you take advantage of Windows 8's navigational gestures in a snap without lifting a finger (well, perhaps one). After clicking the button, which is positioned just under the scroll wheel, moving the mouse a fraction to the left will active the App Switcher, while a nudge to the right pulls up the Charms bar. Its other features include two customisable thumb buttons to switch between the desktop and Windows 8's tile-based Start screen (or something else through Logitech's SetPoint software), an ambidextrous design and Logitech's Unifying Receiver that can connect up to six devices. The M560 will be available from the end of October at a suggested retail price of £34.99 (around £29.50 or AU$45). Logitech has outed a steady stream of Windows 8-geared peripherals over the last year. Its wireless T620, which resembled a black version of Apple's Magic Mouse, activated Windows 8's Start screen and other menus with touch gestures. That was followed by the TK820, a wireless keyboard that bolted a trackpad onto the end that's similarly capable of activating the OS's gestures.